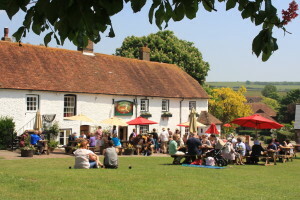 The Tiger Inn has been described as one of Britain’s Best Pubs in Country Life Magazine. The article, which appeared in the 12 February edition of the magazine, was written by Alisdair Aird, Editor of “The Good Pub Guide 2014”. In it he describes The Tiger as “a classic walkers’ pub” with a cosy atmosphere and blazing woodburner, and the “perfect start and finish for downland expeditions”. He also highlights the pub’s selection of local beers and good food.